« 73rd anniversary of the dropping of a nuclear bomb on Hiroshima: Will the USA and UK ever be nuked? U.S. Secretary of State Mike Pompeo says Iran has to start behaving like what he calls a “normal country,” as the United States prepares to reimpose sanctions on Tehran. “This is just about the Iranians’ dissatisfaction with their own government and the president’s (Trump) been pretty clear. 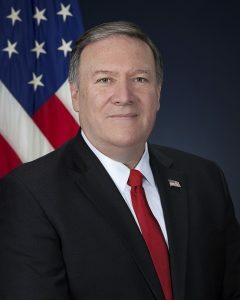 We want the Iranian people to have a strong voice in who their leadership will be,” Pompeo told reporters Sunday. He said the White House would give details Monday about the sanctions that will take effect Tuesday against a wide range of Iranian industries, including its automotive industry, gold, coal and steel. The Iranian government will also no longer be allowed to buy U.S. and European planes and U.S. banknotes. People and businesses involved in those industries were given a 90-day period to wind down their activities. That period expires Monday. Sanctions against Iranian energy exports are set to come back into effect in November. The European Union issued a statement Monday ahead of when renewed US sanctions are set to snap back against Iran after midnight US Eastern time, saying it “deeply regrets” the sanctions and will take immediate action to protect European companies still doing business with Iran. The statement by EU diplomatic chief Federica Mogherini and the foreign ministers of Britain, France and Germany pledged to also work to keep “effective financial channels” open with Iran. “We deeply regret the re-imposition of sanctions by the US, due to the latter’s withdrawal from the Joint Comprehensive Plan of Action (JCPOA),” the statement issued from Brussels begins. The US has ordered all other countries to halt imports of Iranian oil by early November or face punitive measures. In a statement on Sunday Secretary of State Mike Pompeo said the White House will detail implementation of the measures sometime Monday morning. As expected after the Trump administration was unmoved by European leaders’ calls for an exemption, the EU will seek legal protection for firms in the 28-nation bloc to work with Iran by invoking its so-called blocking statute, considered the most powerful tool at its immediate disposal. When invoked, it bans any EU company from complying with US sanctions and does not recognize any foreign court rulings seeking to enforce American penalties. We are determined to protect European economic operators engaged in legitimate business with Iran, in accordance with EU law and with UN Security Council resolution 2231. This is why the European Union’s updated Blocking Statute enters into force on 7 August to protect EU companies doing legitimate business with Iran from the impact of US extra-territorial sanctions. The remaining parties to the JCPOA have committed to work on, inter alia, the preservation and maintenance of effective financial channels with Iran, and the continuation of Iran’s export of oil and gas. Well, I would not conclude that the Trump Administration is unmoved by this. I suspect various ones in it will point to this as proof that the EU is not supportive of USA policy and will consider this another reason for applying tariffs against the EU. Iran’s foreign minister, Mohammad Javad Zarif, met Federica Mogherini, the EU external affairs chief, on Tuesday morning and will meet the foreign ministers of France, Germany and the UK – the three European signatories to the deal – in the evening. The Iranian matter will increase international trade in Euros and away from the USA dollar. That will not help the USA in the long-run. Various nations do not like the trade policies that Donald Trump has advocated. China is one. Europe (see Martin Schultz blasts Donald Trump: Some EU leaders believe they would ‘win’ a trade war with the USA), Russia (see Russia warns of full-scale trade war over US sanctions), Mexico (see EU and Mexico making a trade deal, partially to send Donald Trump a message and/or watch Donald Trump and Mexico’s future), Japan (see EU, Japan Sign Massive Free Trade Deal) and others (see ‘Trump overrules cabinet, plots global trade war’) have concerns. Trade wars have been listed as part of the 18 items to prophetically watch in 2018 (here is a link to a related sermon: 18 items to prophetically watch in 2018). Europe is getting more involved in trade disputes with the USA. Europe and China are looking more towards each other and the Eurasian Economic Union. Trade disputes with the USA will increase. Trade will be a factor in the rise of Europe (cf. Revelation 18). That will not end well for the USA (cf. Daniel 11:39) nor its Anglo-Saxon descended allies (cf. Daniel 8:24-25; Jeremiah 30:7). This entry was posted on Monday, August 6th, 2018 at 7:00 am	and is filed under Prophecy.